Students at High School East can always count on the Spanish Club to provide members with creative and unique ways to learn about spanish traditions and cultures, and this February’s meeting, which called for some time in the kitchen, was no different! Instead of meeting at our normal location, room 905, we met in Ms. Wolff’s gourmet foods room to cook some traditional, and not so traditional, Spanish food. The recipes for the day included guacamole and empanadas, which are both foods that are a big part of the spanish culture. 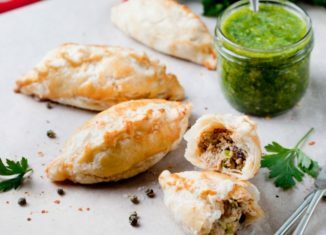 Since homemade guacamole is usually such a popular hit, we kept it traditional, but we decided to add a little spin on the empanadas. Instead of making typical empanadas with cheese and meat inside, we created dessert empanadas with an oreo filling. We used regular Goya empanada discos and filled them with a mixture comprised of crushed oreos, vanilla, cream cheese, heavy cream, and one egg to create this special treat. Both recipes turned out to be hits! In fact, all of the guacamole and empanadas were gone by the end of the meeting. Overall, working in the kitchen was a very fun way to learn about traditional Spanish foods and even put a twist on one of the recipes. Great job to everyone who participated, and a big thank you to Ms. Wolff for letting us borrow her classroom. If you couldn’t join us for the February meeting, be sure to come in March… we will be hosting our very own Escape the Room challenge! Do you Have the HS“E Factor”?